1. 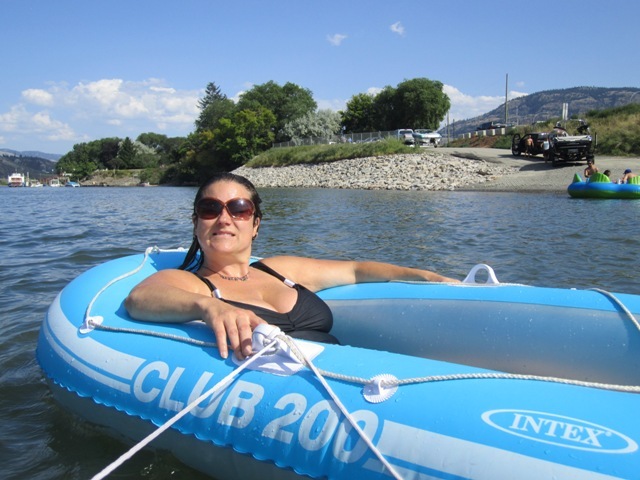 Floating devices – air mattress, tubes, etc. These items can be purchased at Wal-Mart or Canadian Tire at a reasonable price. Be sure to keep food, cameras, etc in waterproof containers and be sure to tie those containers to the raft in case you accidentally flip over. The Thompson River is the largest tributary of the Fraser River, flowing through the south-central portion of British Columbia, Canada. The Thompson River has two main branches called the South Thompson and the North Thompson. The river was named by Fraser River explorer, Simon Fraser, in honour of his friend, Columbia Basin explorer David Thompson. The South Thompson originates at the outlet of Little Shuswap Lake at the town of Chase and flows approximately 55 kilometres (34 mi) southwest through a wide valley to Kamloops where it joins the North Thompson. Highway 1, the Trans-Canada Highway and the mainline of the Canadian Pacific Railway parallel the river. Little Shuswap Lake is fed by the Little River, which drains Shuswap Lake, which is fed by several rivers & creeks. 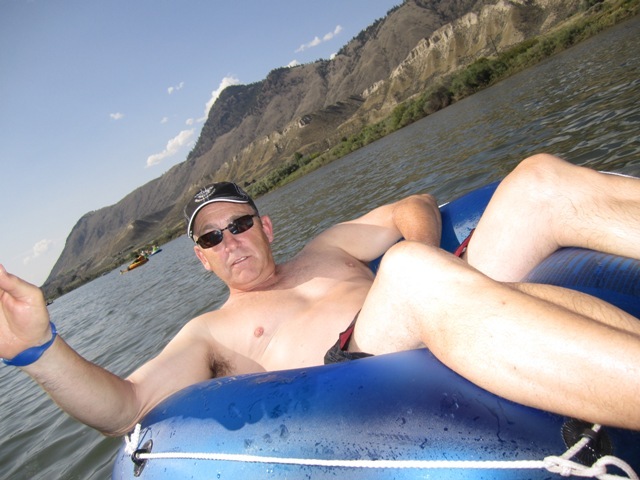 At Kamloops, the combined Thompson River flows 15 km from the confluence of the North and South Thompson Rivers before reaching Kamloops Lake, which is roughly 30 km in length, ending at the town of Savona. From there it flows in a meandering course westwards through a broad valley area. At Ashcroft, the Thompson Canyon begins and the river turns southwestward to its confluence with the Fraser. 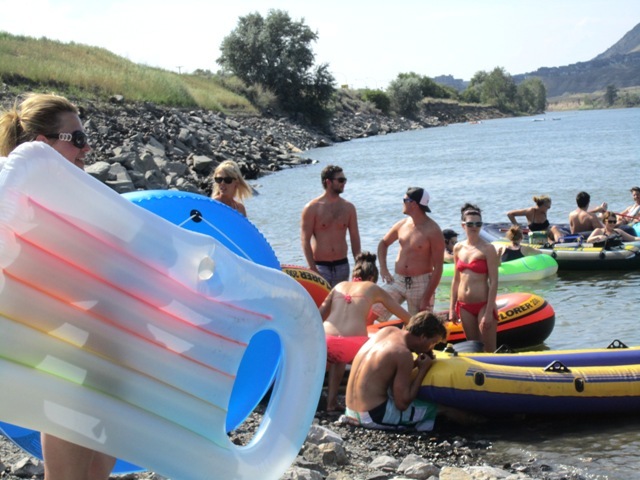 HOW TO GET THERE – Meet your tubing buddies at Pioneer Park and from there load all your rafting supplies into the transport vehicle. Drive east along the Trans-Canada highway and turn right on River Road in Valleyview. Just across the railway tracks you will see the Valleyview boat launch. 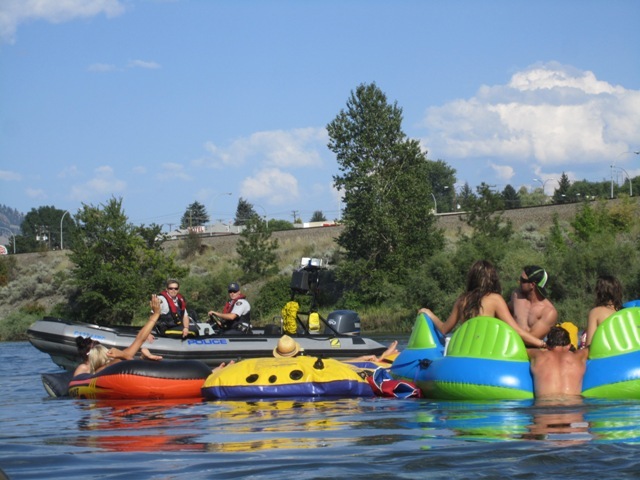 Parking at the launch is reserved for people with boat trailers but you are free to park along Thompson Drive.Pull out your floating devices and plug the electric pump into the lighter and start blowing up your rafts. Throw your supplies in the cargo boat and carry everything down to the river’s edge. It is here where you will need the rope to tie everything together. Paddle yourselves out into the middle of the river and spend the next four hours floating back to Pioneer Park. There are a number of sandy beaches along the way if you want to stop for a picnic or go for a dip. And don’t worry, if the weather turns and things get a bit rough, there is no shortage of friendly boaters willing to help you out.